In response to this need, IEEE developed IEEE802.3af to standardize a system of supplying low voltage power to networked devices via the communications line. It is more commonly referred to as Power over Ethernet (POE). This article focus on introducing some fundamental elements about PoE. PoE is defined across a single network link that includes three basic components. The first one is an equipment delivering power to the cable (often referred to as a PSE, which stands for power sourcing equipment). The second component is a device receiving power from the cable (also known as a powered device, or PD). The third is the cable itself. Typical PDs include IP cameras, wireless access points, and the PSE would normally be a PoE switch or a midspan power injector, patched in to add PoE capability to a non-PoE network switch channel or similar. These two configurations are shown in the following picture. The most prominent advantages of PoE are time saving and cost effective. By reducing the time and expense of having electrical power cabling installed, network cables do not require a qualified electrician to fit them, thus it can be located anywhere. Besides, it has great flexibility. Without being tethered to an electrical outlet, the PDs (IP cameras, wireless access points) could be located wherever they are needed most. Safety is the third advantage. PoE delivery is intelligent and it is designed to protect network equipment from overload, or incorrect installation. Also it has reliability and scalability. PoE power comes from a central and universally compatible source, rather than a collection of distributed wall adapters. It can be backed-up by an uninterruptible power supply, or controlled to easily disable or reset devices. The original PoE application is VoIP phones, which have a single connection to a wall socket, and can be remotely powered down, just like with the older analog systems. PoE could also be used in IP cameras. It is ubiquitous on networked surveillance cameras where it enables fast deployment and easy repositioning. Wifi and bluetooth APs and RFID (radio frequency identification devices) readers are commonly PoE-compatible, to allow remote location away from AC outlets, and relocation following site surveys. PoE is designed to operate over standard network cable: Cat 3, Cat 5, Cat 5e or Cat 6 (often collectively referred to as Cat 5), using conventional RJ45 connectors. The principles of carrying electrical power over Cat5 are of no difference to those of other power distribution systems, but as the power is being transferred over light-duty cable for long distances, the effects of the power loss and voltage drop become significant. 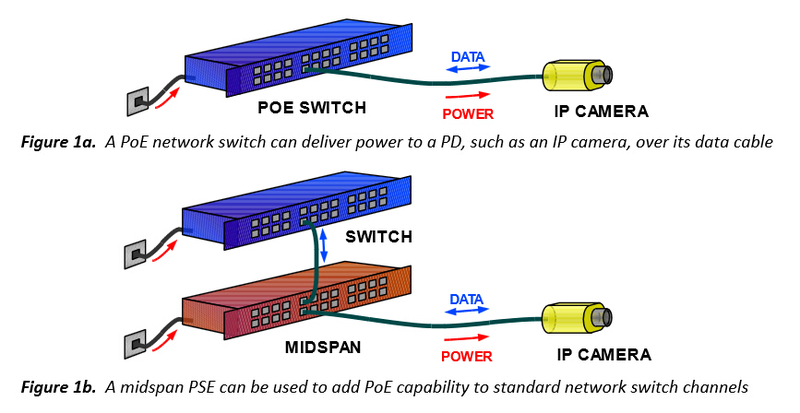 The arrangement and connection to the cabling used for PoE also differ slightly from conventional power wiring, in order to work around the existing standard for Ethernet data. Cat 5 network cables contain a bundle of eight wires, arranged as four twisted pairs shown in the following picture. In the most common type of Ethernet, 100BASE-T or Fast Ethernet, only two of the four pairs are used to carry data; each pair carrying a signal in one direction. These are known as the data pairs, and the remaining two are unused and are referred to as the spare pairs. Although each data signal can be carried within a single pair, PoE treats each pair of wires as a single conductor (a reason for this is that using both wires halves the overall resistance). As electrical current must flow in a loop, two pairs are required to allow power to be carried by the cable, and either the data or spare pairs can be used for this. The PD must be able to accept power from whichever pairs the PSE delivers it to. 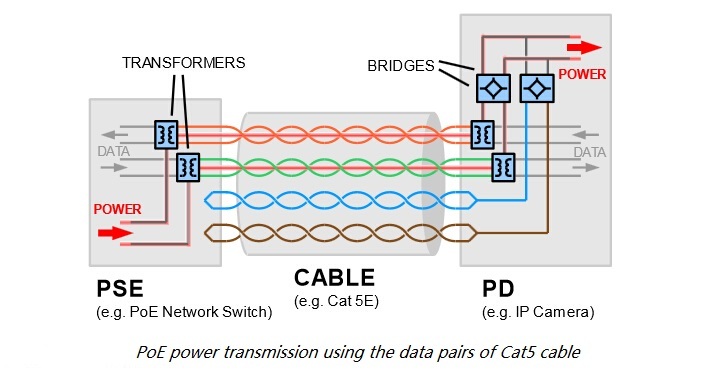 PoE is a convenient and now ubiquitous method for delivering power to a wide variety of loads on standard Cat 5 Ethernet cables. It is no doubt that Power over Ethernet will become increasingly important in the near future. This entry was posted in Gigabit Ethernet Solution and tagged PoE, PoE switch, Power over Ethernet by Aria Zhu. Bookmark the permalink.